Following a 30-year-old man named Rhonda suffering from depersonalization, Some Things That Meant the World to Me is a gritty and beautiful work that is creative and hypnotic, and should stand as an introduction of an original new voice to American literature. When Rhonda was a child - abandoned and ignored by his mother; abused and misguided by his mother's boyfriend - he imagined the rooms of his home drifting apart from one another like separating continents. Years later, after an embarassing episode as an adult, Rhonda's inner-child appears, leading him to a trapdoor in the bottom of a dumpster behind a taqueria that will force him to finally confront his troubled past. 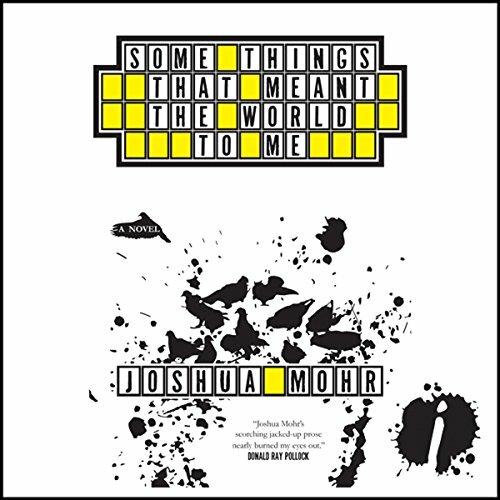 In the spirit of Cruddy and Hairstyles of the Damned, Joshua Mohr has created a remarkable and unforgettable character in this charmingly poetic and maturely crafted first novel. ©2009 Joshua Mohr; (P)2009 Audible, Inc. Narration at times odd. Otherwise insanely good. This book is insanely well written. I enjoyed every part of the imagery. I'm not one to ever complain about a voice/narrator. I normally love them even if other people didn't. In general this Ben was amazing... However, I must admit that I was constantly knocked out of my suspension of disbelief whenever he did a Female character voice. The way that this narrator does women would be perfect for an autobiography read by the author if the book was "Pee Wee Herman's Life Story"
His take on women is comical... and albeit distracting, it does sort of work for the story. I hope Ben Rameaka was being directed to read this way and doesn't really think that this is how women sound. Its a tad bit demeaning. The book and story are worth the annoyance/comic relief though. SO listen anyway. The book simply stinks. Not everything has to be a nicey-nicey feel-good book. I like serious, and sometimes dark stories, but this just was not compelling. Sad things happened to main character, but it was hard for me to like him nevertheless. The rest of the characters were completely uninteresting & unlikeable. The story just never got better. At a little more than halfway through I realized I was wasting my time. Good luck if you download it. Sad, ugly little story that somehow manages to keep you in. It reads like a dime store dective novel. Harsh and bitter it tells the story of a young man who dysfunctional upbringing is the source of his multiple personality disorder and disassociative states, his search for love and for home. A hundred times I wanted to turn it off and not go back to it but it was just like a train wreck - you can't not look. Uncomfortable and challenging and not at all pleasant and yet I think it will stay with me for quite a while. Publisher's Review = Wronger than Wrong!!! I don't want to hurt anyone's feelings but, this book was AWFUL, TERRIBLE and the narration made me cringe! It is sad really that you can't get your money back when a book is this bad. I primarily had a problem with the narration though and how the story was all over the place. Never a cohesive thought was presented in my opinion. I started this audio over about 7 times before I gave up and knew I would never finish it because it just was not interesting enough. The narrator really did not help this book at all. His voice as a woman, any woman drove me crazy! Oh, well better luck next time. I wanted to like this book, but I couldn't. It was dark and confusing, but not in an interesting way. From the beginning, I was irritated. Save yourself. Really painful book to listen to! We were a group of people in a long car ride together listening to this and it was bad. The voices by the narrator and the metaphors by the author. I will not finish this book. By the end of the ride, we just couldn't listen to it anymore. I usually like dark edgy books or bukowski type stories, but this is really badly written. Maybe other people will find something in this book. We couldn't though.